For enthusiasts of the Batman movies are certainly familiar with the Batmobile. Yes, the Batmobile is Batman's car. 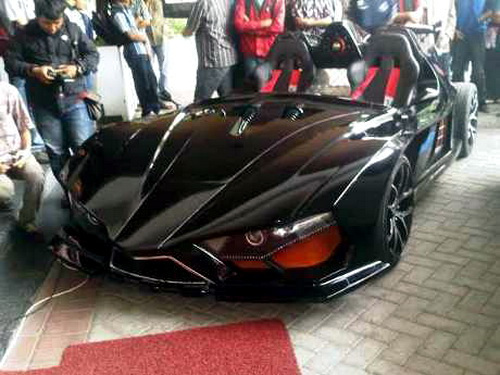 Inspired by Batman's car, some students of ITS (Institut Teknologi Sepuluh Nopember Surabaya) managed to bring a unique Batmobile of their work. According Grangsang Setya Ramadhani, one of the students who participated in this project, the car was named Lowo Ireng (Black Bat). Grangsang also not denied that the Batman's car that inspired him and his friends to create this unique car. "Hence, we also call it as Lowo Ireng when first made in early 2014," said Grangsang to VIVA.co.id in the workshop of the National Electric Motors, ITS, Surabaya on May 23, 2016. Grangsang revealed, the car can go up to speeds of 180 kilometers per hour. In addition, this car can achieve acceleration from 0 to 100 km per hour in just 10 seconds. According to him, it is fairly quick for a supercar made in Indonesia. "The secret of its speed is on a machine that uses a V6 engine, and carbonate materials that we use in the car body, so his car into a lightweight but strong," said Grangsang. It has been proven in several trials that have been undertaken by Lowo Ireng. In fact, Lowo Ireng also considered successfully completed the Tour de Java in 2014. Meanwhile, the fuel used for this car is RON 92 petrol or in Indonesia called Pertamax. Other members of the team that the car maker, Hanif Taufik said the hardest part of the making of the car it is time to make the car body. The reason is, there are indentations in the car body was somewhat complicated, and must detail and took a long time. "Because it's all handmade," said Hanif. When asked about their desire to make the car massively, Hanif answered when he and his friends still do not have that desire. However, the car was already getting offers from several parties. "There were alumnies of ITS own, and the automotive expo visitors who saw this car, and the offer price of Rp.400 million (US. $29,704) to order similar car," said Hanif.